Flowers on the Alan Turing Memorial. Picture taken 22 June 2018, the day before Turing's 106th birthday. The Alan Turing Memorial, situated in Sackville Park in Manchester, England, is in memory of Alan Turing, a pioneer of modern computing. Turing is believed to have committed suicide in 1954 two years after being convicted of gross indecency (i.e. homosexual acts). As such he is as much a gay icon as an icon of computing, and it is no coincidence that this memorial is situated near Canal Street, Manchester's gay village. Turing is depicted sitting on a bench situated in a central position in the park. On Turing's left is the University of Manchester and on his right is Canal Street. The statue was unveiled on 23 June, Turing's birthday, in 2001. It was conceived by Richard Humphry, a barrister from Stockport, who set up the Alan Turing Memorial Fund in order to raise the necessary funds. Humphry had come up with the idea of a statue after seeing Hugh Whitemore's play Breaking the Code, starring Sir Derek Jacobi. Jacobi became the patron of the Fund. Glyn Hughes, an industrial sculptor from Adlington near Westhoughton, was commissioned to sculpt the statue. Roy Jackson (who had previously raised funds for HIV/AIDS and Gay Awareness in Manchester) was asked to assist in the funding raising to make the memorial happen. Within 12 months, through donations and a "village lottery", the money was raised. This allowed the statue to be cast in China. Glyn Hughes had found contacts that could manufacture and ship an identical bronze statue to that which would have cost c. £50,000 in the UK. The cost of the memorial was achieved with the £16,000 raised. Turing is shown holding an apple. The cast bronze bench carries in relief the text "Alan Mathison Turing 1912–1954" and the motto "Founder of Computer Science" as it would appear if encoded by an Enigma machine; 'IEKYF RQMSI ADXUO KVKZC GUBJ'. However this appears to be an "artist's impression" of an ENIGMA encryption, rather than an actual one. ENIGMA could not encode a letter as itself and there is a letter "U" at position 14 of both the plain-text and the cipher. 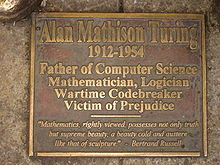 A plaque at the statue's feet says "Father of computer science, mathematician, logician, wartime codebreaker, victim of prejudice". There is also a Bertrand Russell quotation saying "Mathematics, rightly viewed, possesses not only truth, but supreme beauty — a beauty cold and austere, like that of sculpture." Flowers on Alan Turing's Memorial, 2012. Turing Memorial with the Engineering and Physical Sciences Faculty Office of the University of Manchester in the background. Turing Memorial looking at Sackville Street. Sackville Park looking toward the Sackville Building, University of Manchester. The London 2012 Olympic Torch stopped off at Turing's statue in Manchester on his 100th birthday. ^ SJ8497: Alan Turing Memorial, Sackville Park, Manchester, Geograph, UK. ^ Andrew Hodges, Memorial sculpture of Alan Turing in Sackville Park, Manchester, The Alan Turing Internet Scrapbook, The Alan Turing Home Page, UK. ^ Cooksey, Katie (24 December 2013). "Alan Turing: Manchester celebrates pardoned genius". BBC News Online. ^ Alan Turing Memorial, Sackville Street Gardens, Lost in Manchester, Blogspot, 15 May 2009.